Who’s to blame…the rock music or Bush for Al and Tipper Gores seperation? According to CNN – Former Vice President Al Gore and his wife, Tipper, have sent an e-mail to family friends announcing a mutual decision to separate, a longtime family friend told CNN. “We are announcing today that after a great deal of thought and discussion, we have decided to separate,” the message said. Gore spokeswoman Kalee Kreider confirmed the authenticity of the e-mail but decline to comment further. The couple, married for 40 years, has four grown children. 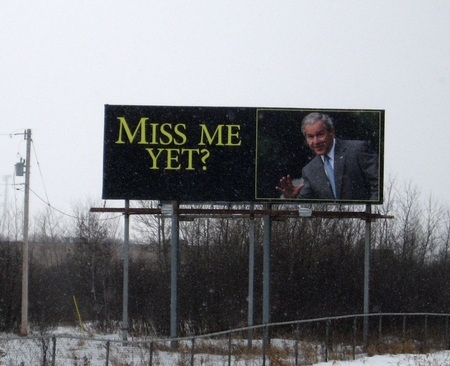 Well we have all seen the email chain go around when it is a phot of Bush waving with the quotes under it “Miss Me Yet”, but it seems oneone tea party member fan has taken it to the next level and made a billboard along the 35 in Wyoming. So what is George W. Bush upto?? Georgie boy is going to be a motivation speaker. Not too sure about the motivation part, but I’m sure with George making up his own words as he goes along should be entertaining. He will be featured as the “special guest speaker” at an October 26 “Get Motivated!” business seminar in Fort Worth, Texas, according to an announcement on the organization’s Web site. Bush’s former Secretary of State Colin Powell and former New York City Mayor Rudy Giuliani are set to join Bush at the October 26 event. What?? I thought Colin Powell did’nt like Bush? I guess the Benjamins always have away of bringing old friends back together again. So how much for all these people you ask…$500, $1000 nope $4.95, cheaper than a Happy Meal at McDonalds. Here is a piece by Steve Huntly from the Chicago Sun-Times, that raises all the questions we have today about the love affair that the media and others have with Obama and the thin veil it is hiding behind. Have you heard the news? President Obama inherited an economic mess from the Bush administration. You say that’s hardly news? But it’s been the message sounded over and over by the White House. Top Obama adviser David Axelrod said on one of the Sunday news shows, “He walked in the door, we had the worst economy since the Great Depression.” In San Francisco, Obama talked of being “busy with our mop.” White House heavy hitter Rahm Emanuel used the worst-economy-since-the-Depression line on a public TV news show. Take, for example, all the talk of inheriting the worst economy since the 1930s crisis. That came in response to the news that the federal deficit hit $1.4 trillion. The MSNBC blast against the chamber appears to dovetail with what the Politico newspaper reports is a White House and Democratic effort “to marginalize” the business organization. That echoes the administration assault on the Fox News Channel: It says Fox isn’t a news organization. The White House trying to dictate who’s a news organization. Democrats out to gut a business group. Obama media allies damning Americans as racist, unpatriotic and treasonous. 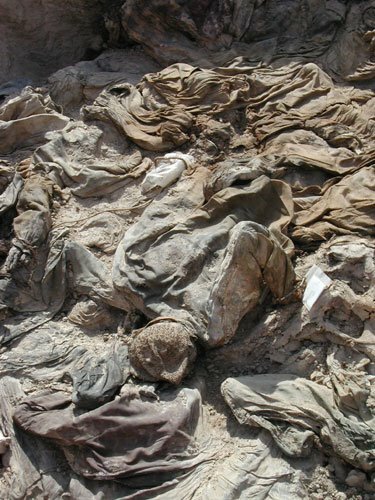 Is this the America Obama promised when he campaigned to end the cynical and divisive politics of the past? It raises very good questions and points out some great points and questions the article from CNN asking if the GOP are in trouble, are they, or is it just that so many crazies are getting the “media” spotlight and not the run or the mill normal people that are starting to see more clearly and ask better questions and know when we are getting the run around. So, I wonder if she would still say the exact same thing? The unrealistic Hype of Obama? So, I read time and time again of those people saying, “obama has not had enough time in office”, “Obama can’t do everything at once”, “Obama can’t clean up this mess that quickly”…The fact is, he said he could and he made promises he could not keep.He thrived off it, he needed it for your vote! Do you think he was going to say, oh no I cant do half of what you think I can? I mean Europe is even wisening up, yet in or own backyard so many people have blinkers on. The National Football League DOES, in fact, have pay caps. Tech firms don’t crash the whole world’s operating system when they go bankrupt; quarterbacks who make too many risky passes don’t have to be rescued with hundred-billion-dollar bailouts. And many people gave Bush a hard time for stupid remarks. Look at O-man people, he is not all that, he is human, but he created this hype he can’t live upto himself you bought into it. Here we go again…another tape of Osama Bin Laden with voice only and no video. I guess the Taliban must be travelling light as I’m beginning to wonder if the Taliban have lost all video and camera equipment over the past several years? Well jeez thanks fake Osama D-bag for the reminder. Fake Osama also offers a few words about Obama saying a vulnerable man who will not be able to stop the war, as he promised, but instead he will drag it to the maximum possible extent. By Keeping Robert Gates as defense secretary — a holdover from the Bush administration, he sees this as prolonging the war terrorism. Obviously by that statement ASSama is just pissed, as he even knows O-man understands very little about Defense of this country and I’m sure he was hoping the job would go to someone else that had no clue about what they were doing. Well ASSama, even O-man is not that stupid. Yawn. Is the same message we have heard many times.Osama ASSama is most likely dead, its been 2 years since he was last seen via video and its just a idle attempt to keep the grassroots of terrorism alive, eventually Assama is going to have to show his face or even his followers with the slightest amount of common sense are going to reliaze he is dead or seriously ill. The Cubans and Fidel even know that.